I received this book from Scholastic as a prize along with its sequel Show Stealer. It arrived just as I went away for a week away with my husband so I didn’t have chance to read it until we get back. I’m glad I didn’t rush read it. It’s a fantastically rich book full of great plot, good characters and imaginative world building that’s both relevant and slightly ominous given current events. The book is set in the future, around the year 2045 although you didn’t get the feel of anything futuristic so the date is not important other than it’s a portent for our own time. Between 1945 and the book’s setting, people in England started turning on ethnic minorities and illegal immigrants calling them Dregs and using them as a scapegoat for all the wrongs in the world. They segregated them to the edges of the cities, to the slums and then they shut down access to education, health care, good jobs and any hope for the future. Pure English are the masters of this world, ignoring and demeaning the Dregs. The Cirque came about when Dregs were forcibly taken from their homes and used to perform dangerous stunts for the amusement of the Pures. The more dangerous the acts and the more likely a Dreg was to die, the more popular the Cirque grew with the Pures. The Cirque is a dangerous place for the acts, run by a sadistic wanna-be-Pure called Silvio who uses whips and starvation to keep his slaves under control. 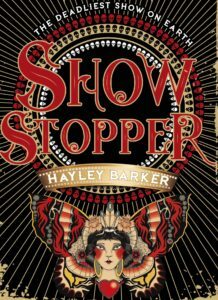 The Cirque has finally made its way to London and Ben, a highborn Pure, is excited to see the show and the star act, a high-wire trapeze artist called Hoshiko. When intentional sabotage causes Hoshiko to accidentally fall into his family’s box it sets off a chain of events that threaten the lives of everyone and the future of the two worlds. Ben and Hoshiko have quite the complicated relationship. Ben is the son of the Minister for Dreg Control and Hoshiko hates Pures with her whole soul. They immediately have a connection but it does take some time for the attraction to realise which is great as it manages to leap over the whole ‘love at first sight’ trope. The ancillary characters are wonderful. I loved Amina and Greta and Priya and loathed Ben’s parents and the Ringmaster Silvio. The villains were a little one-dimensional but with slight peeks into a richer personality. For example, Ben’s mother seems a very ‘bad guy’. Yet we see glimpses of a mother’s love caught under her ruthless political drive. The world building was lush and you could almost feel the slums at the edge of the city, the private schools with their fences and the Cirque standing in the centre of town; a neon temptation for Pures to sate their bloodlust under the guise of entertainment and ‘opportunity’ for the Dregs. It reminded me of the degradation of Roman Arena’s where criminals were thrown to the lions for the baying public. Each chapter is written either from the point of view of Hoshiko or Ben. From Ben we see the rich life of a Pure and how they are indoctrinated into believing that Dregs are inferior. We see Ben’s contact with the few Dregs he knows and how his views are shaped by them and his family. From Hoshiko we see the bitter truth of the Cirque, the abuse and slavery and the constant danger. We see the resilience of the human spirit and the idea that family is who you make it. There is quite a horrific part later on it the book which I won’t spoil but did elevate the book from teen to YA for me. All in all I really enjoyed this book and am really looking forwards to reading the sequel.